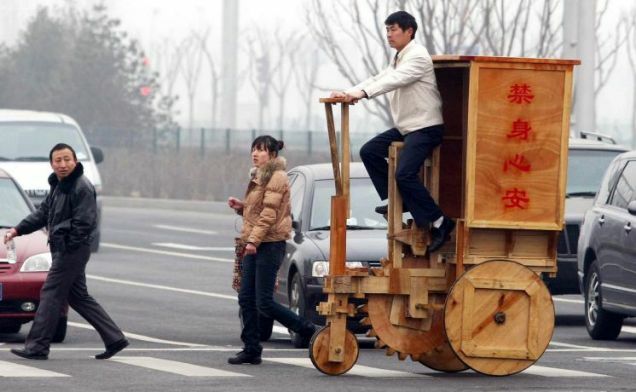 From Metro.com.uk comes news that Chinese historian Xu Quan Long has found ancient plans of the first bicycle and has rebuilt a working model. Previously, the earliest known example of a bicycle was the wooden 'velocipede' invented by German engineer Baron Karl von Drais in 1817. It wasn't until the development of metal-framed 'boneshakers' in France in the 1860s that bicycling began to achieve popularity. Xu Quan Long said he stumbled across the drawings while studying the works of legendary ancient Chinese inventor Lǔ Bān (魯班), who was born more than 2,500 years ago. He then recreated the original design using materials available at that time. Xu Quan Long said that Lǔ Bān's notes regarding the bicycle were unfinished. Other documents writted by Lǔ Bān's students in the same year suggest that he was actually killed while riding his bicycle. Lǔ Bān was struck from behind by a horse-drawn carriage driven by a "blue eyed devil" named Ÿagoff K. Pintek, who later wrote in his own journal that he (Pintek) had just invented a game called "bump the biker". Even 2500 years ago, Ÿagoff K. Pintek's actions were so egregious that his name became a byword for boorish behavior. According to Wikipedia, as his infamy spread the Chinese were unable to pronounce his unusual first name and they settled on Jagoff. Chinese literature from that time is replete with comments like, "don't be a such a Jagoff, one Pintek is too many". Graffiti found at the site of the terra cotta warriors in Shaanxi Province has been translated as saying, "your ancestors are Jagoffs". His legacy is memorialized in modern times by the use of his name as a pejorative reference. Jagoff Pintek's direct descendent, Mike Pintek, is a disk jockey and talk-radio personality who was recently noted in Pittsburgh for expressing his own desires to bump and/or frighten bicyclists. Although (Mike) Pintek later acknowledged that "mistakes were made", he has not apologized, retracted, or corrected his outrageous comments. An apology sounds like this: I said insert actual comment here. I shouldn't have. I was wrong. I am sorry. I apologize. I will not do it again. An apology does not sound like this: Did I say things that weren't smart? Sure. Did some people take offense? Yes. But what I meant to say was insert something completely different here. He's making the old Ÿagoff proud. In 1655 a wooden tricycle was invented by Stephan Farfler near Nuremberg, Bavaria, Germany.